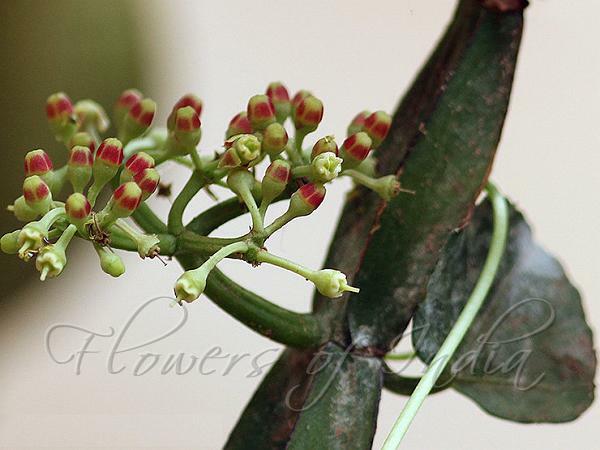 Veldt Grape is a perennial shrub reaching a height of 1.5 m and has quadrangular-sectioned branches with internodes 8 to 10 cm long and 1.2 to 1.5 cm wide. Along each angle is a leathery edge (wing). Toothed trilobe leaves 2 to 5 cm wide appear at the nodes. Each has a tendril emerging from the opposite side of the node. Racemes of small white, yellowish, or greenish flowers; globular berries are red when ripe. It is probably native to India or Sri Lanka, but is also found in Africa, Arabia, and Southeast Asia. 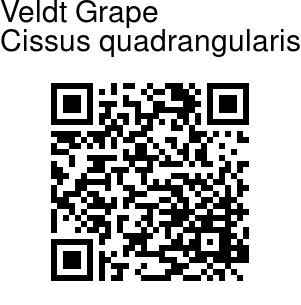 Medicinal uses: Veldt Grape has been used as a medicinal plant since antiquity. In siddha medicine it is considered a tonic and analgesic, and is believed to help heal broken bones, thus its name asthisamharaka (that which prevents the destruction of bones). It is said to have antibacterial, antifungal, antioxidant, anthelmintic, antihemorrhoidal and analgesic activities. It is one of the most commonly used medicinal plants in Thailand.